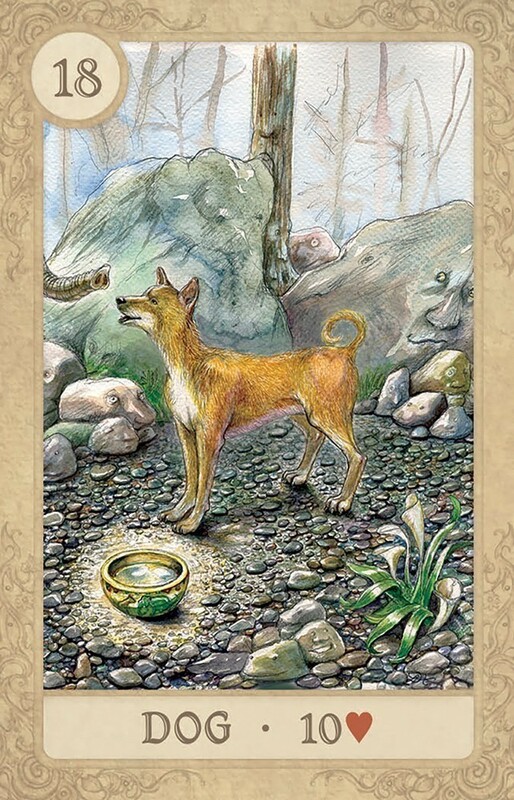 of this oracle system, allowing this to be a hard-working deck. 38 cards, 2.25" x 3.5"
I have had the pleasure, the last few days of working with this sweet treasure of a Lenormand, the Fairy Tale Lenormand by Lisa Hunt and Arwen Lynch Poe. The cards come in a little tin, which is pure brilliance on the part of U.S. Games Systems. I adore the tin, and it will last forever. Cardboard cannot compare. 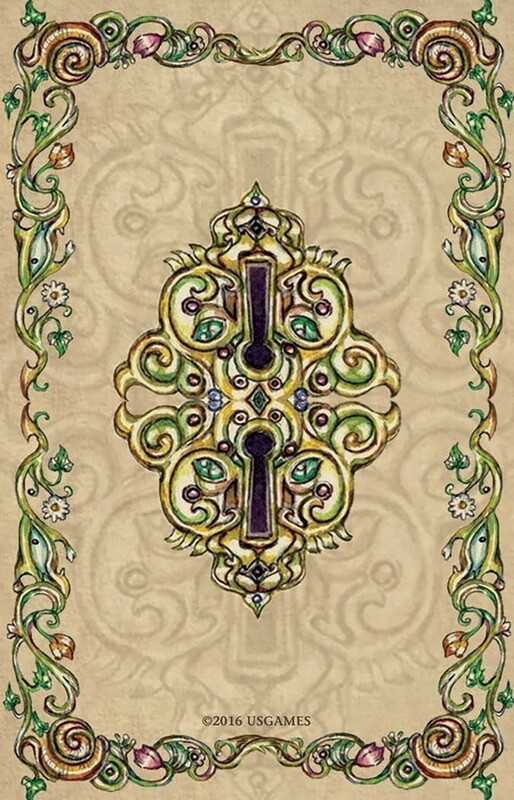 The deck is a standard 36-card Lenormand format with an extra lady and gentleman card bringing the total cards to 38. The card stock and texture is perfect. I would not expect anything less from this publisher. The artwork is classic Lisa Hunt; devastatingly sweet and detailed. Somehow the Lenormand size does not detract from the art at all. You can see every exquisite detail. I could just live in these cards forever. I don't want to put them down. I know the purpose of the deck is divination, but take out each card, one by one and read the story that accompanies it in the little guidebook and you are immediately transported back to childhood days and fairy tale fantasies. This guide is well written and compelling. You will read it because it's delightful, not because it's necessary. I love everything about this deck and I can't say enough wonderful things about it. 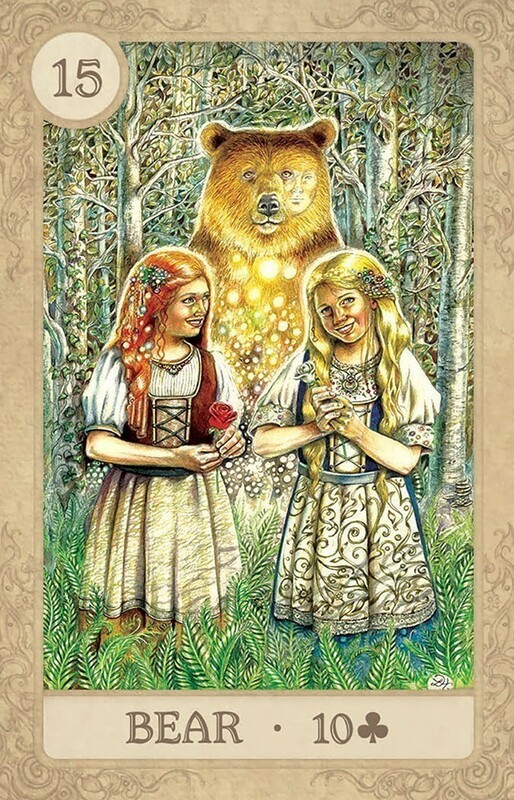 End note: considering how collectible Lisa Hunt's Fairy Tale Tarot has become, I would suggest buying at least two copies of this deck. To ask Lisa Hunt to illustrate a traditional Lenormand deck was really throwing down the gauntlet. Yet, once again, she rose to the challenge, with a wink and a nod, and created a deck that appears straightforward enough to satisfy the most demanding traditional cartomancer, but also contains the tiny embedded symbolism her loyal fans look forward to. 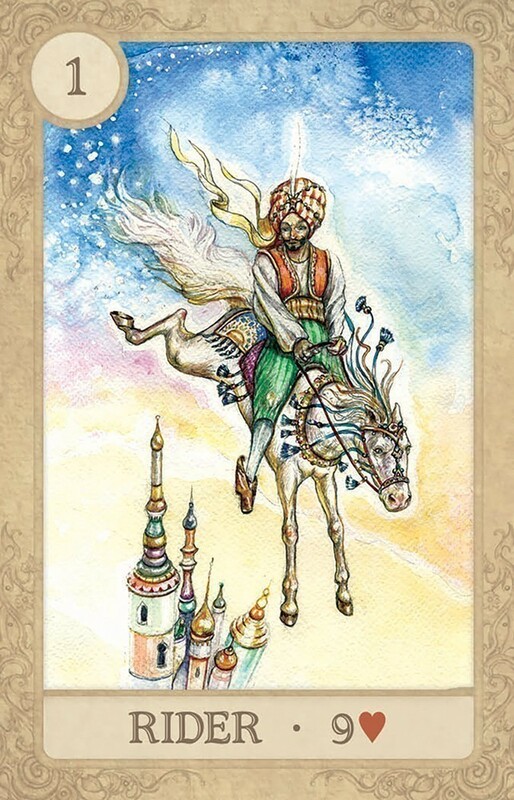 Lenormand is not tarot. It is meant to be read precisely based on the predominant symbolism and the placement of cards. Ms. Hunt’s drawings meet that criteria nicely. 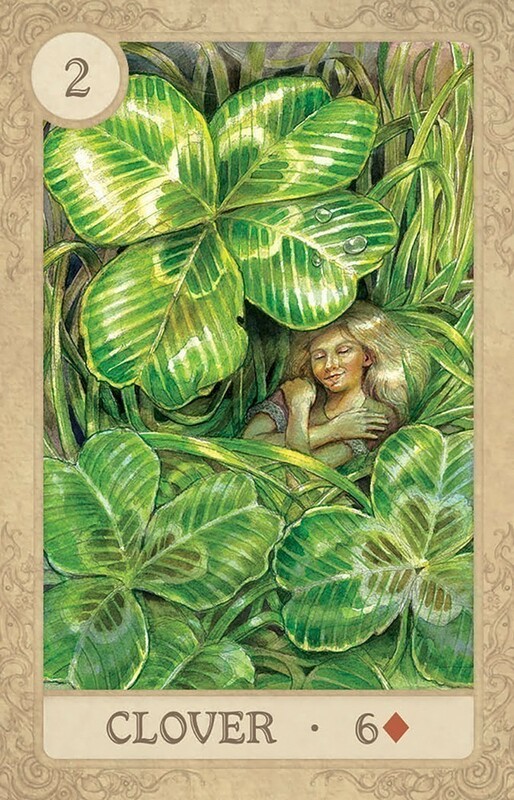 Those who choose to look closer, however, will find that the lady in Clover seems to have a blissful secret the rest of us cannot see. Then there’s Tree. Of course, we expect the face emerging from the trunk, but what about those roots reaching out like octopus arms to grasp the ground. 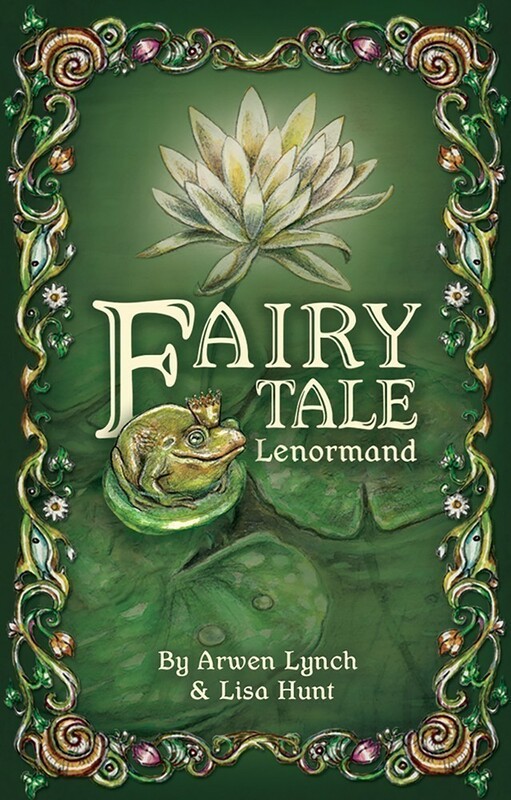 Arwen Lynch does a superb job of linking the appropriate Fairy Tale to each card and explaining how the archetypes in the tale lend themselves to the Lenormand symbolism. 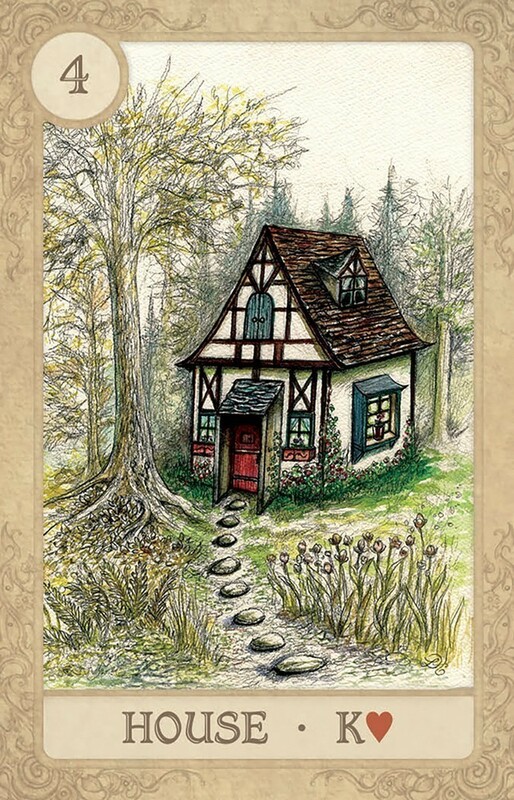 This is a lyrical and captivating addition to the Lenormand library. Contained in a beautifully designed metal box, it’s a special treat for card lovers and the people who love us.